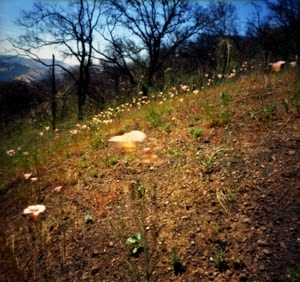 My photograph, "The undeniable existence of ephemeral beauty" (from the series, From destruction grows a garden of the soul) will be included in The f/D Book of Pinhole. The f/D Book of Pinhole is a collection of pinhole photos by 99 photographers, representing the North and South American, European, and Asian continents in geographical and aesthetic diversity. The photographs show the "pinhole look" and the unique ways in which pinhole works with motion and time, bent film planes, infrared, and other techniques and formats. Kier Selinsky and Libby Selinsky, founders of the f/D website and Subjective Press, are seeking funding to print the book through January 1, 2017 via Kickstarter (see my photo in the examples of printed book pages there!). Backers can receive not only the book, but also a 23" x 25" press signature from it and/or a print by Kier Selinsky. Looks great. Hope it gets funded. Thanks, Jim - and thanks again for letting me know about this. Fingers crossed!